2.1. 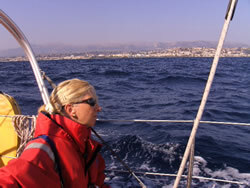 Sailing along the French Mediterranean coast, 2007. 22.08.07 (continuing) At pontoon E in the Port-Saint-Louis harbour - we phoned the Capitainerie whilst waiting in the lock - someone is waiting for us. A friendly help to take the ropes and tie up safely: there is a strong current and a nasty little sidewind. 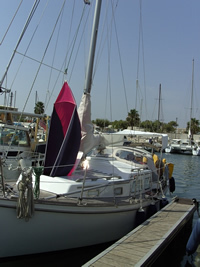 We want to stay here about a week or so, to put the mast and prepare the boat again for sailing. Our neighbours are German, English, Swedish, Danish, French (also!) and even from New-Zealand. Some just arrived in the Med, others are preparing to dismast and to go up the Rhône... In fact: we meet here a very mixed community of "travellers". So, rapidly, informations, stories, experiences, addresses are exchanged. 29.08.07 Nehalinnia is again a sailing boat! Our son Olivier joined us, and Sunday we put the mast up. The next day we had our first "bad-weather-in-the-Med-experience": very windy from the South - 30 knots - three drops of rain... and for the following days a strong mistral is forecasted! 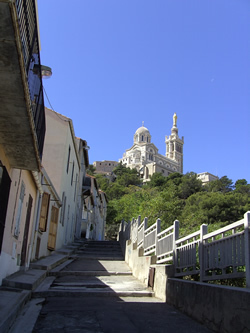 02.09.07 We leave Port-Saint-Louis-du-Rhône with good weather heading for Marseille where we hope to find a berth in the Vieux Port. If not, we can always go to l'Estaque or the Frioul Islands - where we certainly will find a berth, so was told us in Port-Saint-Louis. 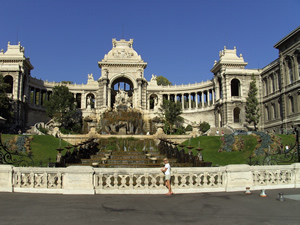 But to visit Marseille it would be more complicate. There is little wind during our passage through the Golfe de Fos and the yellow smoke is the only cloud we will see today. We try to sail about a mile or so but approaching Cap Couronne we have to start the engine. Motoring along the Chaîne de l'Estaque we have for the first time a "far away"-feeling. Carro, Sausset-les-Pins and Carry-le-Rouet are passing by and then appears, far off, Marseille and on starboard , the Frioul Islands. Click here for an Overview and our notes concerning the harbours. 06.09.07 Tomorrow we will leave Marseille. After three days at the CNTL visitors pontoon, we found, for the last two nights, a berth at the SNM, the oldest club of the Vieux-Port. The berth here is very well protected from the mistral; at the CNTL it was sometimes a little bit difficult when, f.e., on tuesday the wind was blowing 25 knots in the harbour and a swell made the vicinity of the entrance very uncomfortable. During the four days of our enjoying stay we had the opportunity to walk through Marseille and see the numerous faces of this multicultural metropolis - in all the meanings of this word! We saw the Boulevard de la Canebière, the Panier - the cradle of the city - and the pearl of it, the Vieille Charité. At the Fort Saint-Jean we looked how the wind was marrying the sunset, in marvelous red skys. 07.09.07 We leave Marseille, looking behind us a last time: this city has charmed us very much, so we certainly will try to come back here! And now: on our port, le Château d'If..., on starboard, the Frioul Islands. We are heading to Cap Croisette and when we go around the Ilot Tiboulen and the Ile Maire the wind eases, so we start the engine. To find some wind we decide to go round the Ile Riou and let the inshore passages between the îlots and islands on our port but the wind falls completely. In our NE the calanque Sormiou and the calanque Morgiou.. We choose calanque Morguiou to stay overnight and anchor in 11 meter clear blue water, in the authorized area, just outside the yellow buoys deeper in. We put 35 m 8mm chain because a lot of tourist boats make the anchorage very "rolling". But at six o'clock no more boats and except three other sailing boats at anchor, we are alone in this very nice and well sheltered calanque. 08.09.07 After a very quiet night we spent the morning by swimming and just enjoy the calm of the bay... until the tourist boats arrive again, about 11a.m. 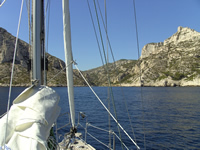 !So we decide to to leave for Cassis, only 5 miles further on. The harbour is full, but the harbour master - very friendly - finds us a berth in the outer harbour on a "plastic" pontoon. Cassis is very charming but in this september weekend very crowded. Around 6 p.m. - it's saturday - when when all the local boats are entering the harbour we are so heavily rolling on our "plastic" pontoon that we decide to leave the next day to Bandol. But at 8 p.m. again flat water and no more rolling: everyone was back ...and so we have - again - a quiet night. 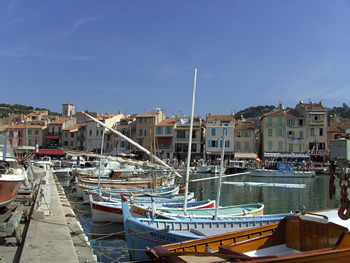 09.09.07 We leave Cassis around midday for Bandol. There is a good sailing wind, but about halfway, Eric hurts his leg by hurrying to the mast to clear a sheet - and rolling with one foot over the other one - after a gybe. 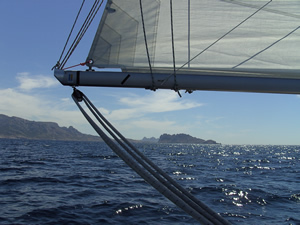 To go deeper in the Baie de la Ciotat to recognize the - not so charming - Port de la Ciotat we had to gybe and to go half wind. 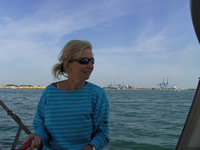 Kaat sets immediately the tiller pilot on the helm , so that she can take the cold compresses. First aid-kit. New gybe, and heading to Bandol! Sorry for La Ciotat! Bendor Island is to be left on port - the narrow passage between the coast and Bendor is too shallow and in the large bay of Bandol we'll have all the room to prepare our entrance. 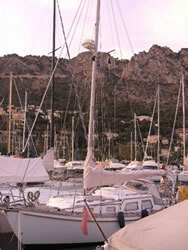 Before we left Cassis we made a phone call to the Capitainerie of Bandol, so we are sure to have a berth. Accueil-pontoon on the right after the entrance, near the fuel station, and two minutes later we are directed to panne K, the visitors pontoon, just on the the opposite. 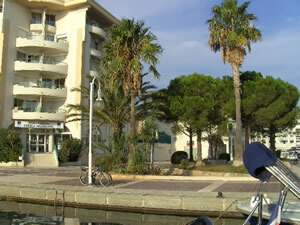 17.09.07 We are still in Bandol: the injury on Eric's leg was worse than at first sight, so we went to the doctor. His verdict was: "Out of question to continue - hors de question... - until ..." . But Bandol is, so said the doctor, not the worst place for a forced stay! And that is very right: the harbour is comfortable and well sheltered although with a strong mistral there are better places than on pontoon K ... So we can change our spot on the bigger boats pontoon K for panne E where the small local boats have a berth in all quietness! 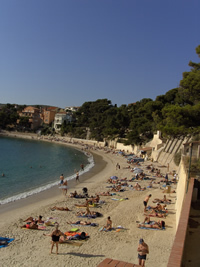 29.09.07 Today we will leave Bandol for the Ile de Porquerolles, the most known and touristic of the Hyères Islands. Last monday we got the "green light" but the mistral took an other decision: the time of a heavy coup de vent should be a good security for the injury! 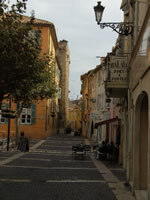 So our stay in Bandol was again a little bit longer, but without any regret. After our departure from Bandol at 9.30 a.m. with a grey, dark sky and NE 3 to 4 we are heading to Cap Sicié. But rapidly we have wind in the nose and we start tacking; we make good progress until the freshening wind builds up a nasty sea in the vicinity of the cape. That will spoil a little bit the pleasant navigation. After the dark rocks of Cap Sicié we see on our port the Saint-Mandrier peninsula and then Toulon while at the horizon Porquerolles and the Giens peninsula are appearing. But the wind is easing and the nasty sea remains , so we decide to start the engine. to make more comfortable progress. 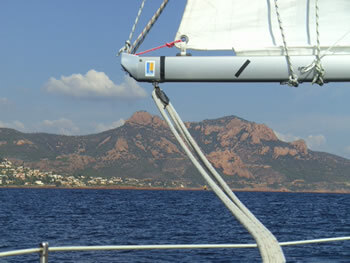 Approaching Grand Ribaud Island again the wind is freshening: the entrance of "la Petite Passe" to the Rade de Hyères is a real wind funnel. 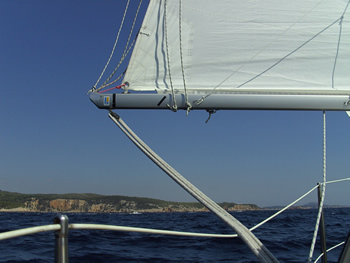 This gives us the opportunity to reach Porquerolles Island sailing! In de Langoustier Bay we see many boats at anchor ... We have a little hesitation, but keeping in mind the weather forecast for tomorrow - Coup de vent - and our former phone call to the capitainerie - "no problem, you can choose a berth at pontoon B" , we decide to join the harbour and in fact: on panne B we have an extended choice of available berths. This luxury is only possible in late September. But at 6 p.m. the harbour is full, and the anchorage almost deserted: it's Saturday! 30.09.07 Porquerolles Island: the pearl ... but today we have only a poor impression of what it should be with bright sunshine! Our wind meter gives 25 knots and there are violent gusts from the east. But the harbour is a good shelter: we are solidly moored and our big red balloon (a souvenir from our canal trip) keeps the neighbour at save distance. We start to explore the island : at first the village where every 30' a boat from Hyères -or from an other harbour from the mainland dumps its part of the daily invasion of tourists. Although this nothing compared to what happens in summertime ... Then the Fort Saint-Agathe (1531): we are the last visitors of the season and we are mostly alone ... "the invasion" is somewhere else on the island. There is an interesting exhibition of the history of the island and the organisation of life on it. After that a solid walk to the lighthouse and again - very surprising - where are all the other tourists? 01.10.07 Beautiful weather! 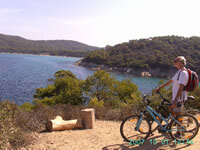 We will, for better exploration of the island, hire a bicycle (12 euro a day). Our first stop is the Notre-Dame beach for a small picnic. Some people are swimming, a British yacht is anchored and a lot of sails appear at the horizon, coming from Hyères, Bormes-les-Mimisas and Le Lavandou ... Then we are mostly alone, cycling to the north-east. The sandy roads to Cap Mèdes is becoming difficult: steep climbings and many stonewalls force us to walk sometimes. 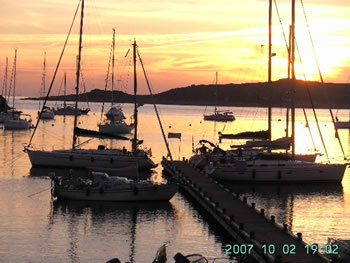 But the wonderful outlook on Port-Cros from the cape is really worth the trip! We 'll join after a shore rest the Fort de la Repentance in the centre of the island. A Seraphin monck is working on the roof off the fortress; he lives there all the time and has done over 12 year almost at the restoration works. Today there is less wind so every path can be explored; with strong winds, because of the fire danger, many paths are closed. Then we go to the south coast: the calanque du Ostaou, and more to the west, we visit the Hameau: there is a scientific centre where also the direction of the Parc régional is established. A nice shower is more than welcome after this dusty expedition! 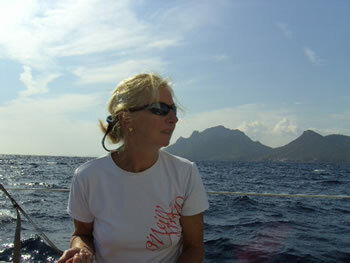 02.10.07 From Porquerolles to Port-Cros we are motoring (no wind) 8,59 NM. That island and his little neighbour islands is the most protected of the Iles de Hyères. There is a little harbour, not very well sheltered and not very deep. We arrive about 12H30 and take the only vacant berth at that moment. A great number of small motorboats and other rather big boats with divers are occupying the pontoons. 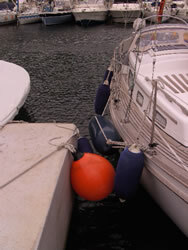 The mooring buoys in the little bay are almost all taken. We go for a long walk - no bicycles here! - on this very protected and wonderful island. - cigarettes and dogs are not allowed - and we can imagine what a disaster it would be to have fire here! Although the staying at the island is very regulated we didn't notice any kind if control: you pay your harbour fee and that's all: no asking if you have a black water holding tank or not ... The only real restriction concerns the water supply: 20 l per boat per day and only 1/4 of an hour a day available between 7.45 and 8.00 pm! At 5.30 p.m. we are back on the pontoon, where now only a few sailing boats are still moored, all the others are gone. 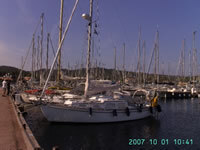 03.10.07 The weather forecast for today is nor very good: a risk of thunder showers with gusts, so we decide to leave Port-Cros for Bormes-les-Mimosas. Rod Heikell is very enthusiastic about that harbour and also the Dutch boat Lizzy (www.sv-lizzy.nl) had a stop here and report a pleasant stay. We have 8 M of comfortable and quick navigation with a ENE 4 to join the marina. We get a warm welcome and a good berth, the facilities are wonderfully well kept (brand new) but for shopping it's a disaster. Almost every shop is closed (even the Tourist office) and the marina is far away from the old village. There are still many tourists, everybody seems to go to Le Lavandou for shopping, it's only a 2km walk along the beach. But still ... heavy loaded with water bottles its not a pleasant idea, so we decide to leave the next day. 04.10.07 Only 15' motoring from one marina to the other. The Capitainerie of Le Lavandou gives us a berth in the new harbour: no laid-mooring here but a catway (the first time since Port-Saint-Louis-du-Rhône!). But, alas, not everything can be perfect : the facilities are really poor! For a harbour with 1100 berths only 2 toilets and 4 showers are available in October , with opening hours from 8.30 till 12.00 a.m. and 1 p.m. till 6 p.m.!, so we are in the obligation to use our own "facilities". It's market day and Le Lavandou is still very lively on this early October day: the terraces are crowded and there is still a holiday atmosphere. Only some dark clouds obscure the sky , but no rain, and no thunder ... We go for a walk along the coast path to one of the 12 beaches of Le Lavandou: St-Clair ; the wind is freshening - our wind meter will note 21 knots ENE - while we follow le Sentier des peintres ("the painters path"). The neo-impressionists Van Rijsselberghe and Cross made many paintings of the beautiful scenery; many reproductions are showed along this circuit. 05.10.07 The weather is uncertain: the risk of thunder showers is increasing. Thunderstorms are announced for the afternoon and the night. But ... after a dark sky in the morning we find a bright sunshine in the afternoon and not a drip of rain... Big disappointment for the locals (no rain since April!) but we don't regret! 06.10.07 No thunderstorm overnight, and again after a dark morning, bright sunshine in the afternoon. So we go again strolling through the old Le Lavandou and along the coast path to enjoy the beautiful evening light ... some swimmers are still enjoying an autumn bath. 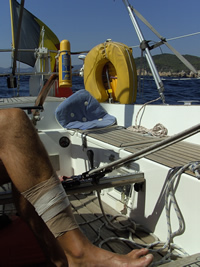 07.10.07 Departure for Fréjus, 30 miles navigation to do. The first seven miles along a very nice coast with the Massif des Maures behind it. As far as Cap Nègre we go alongside the beaches of le Grand Le Lavandou. Various landscapes with more or less urbanisation are passing by. 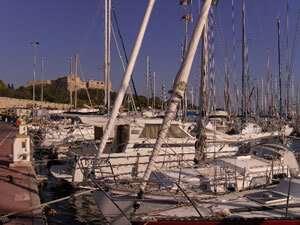 Then the Cavalaire bay is opening at port: sailing-boats, motor yachts are appearing - it's sunday. At the approach of Cap Lardier the wind - variable 2 - is freshening a little bit and turns south. We unfurl the genoa and stop the engine. 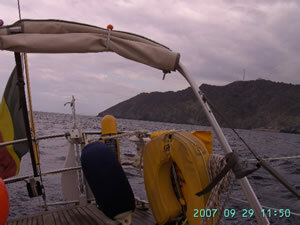 While sailing up to Cap Camarat we have a nice backstay wind. To maintain the comfortable sailing we decide not to go head directly to Fréjus, we are not in a hurry! While the bay of Saint-Tropez is opening to our port, the sea is becoming confused: not because of the wind but because of a great number of big motor yachts rushing around and creating uncomfortable waves... 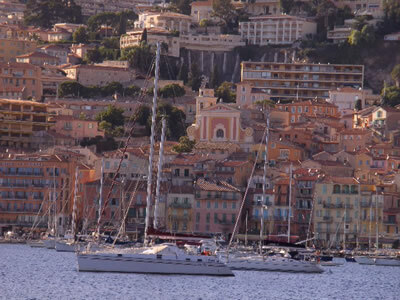 But also we meet some very nice sailing yachts: at Saint-Tropez it is the last day of the famous regattas Les Voiles de Saint-Tropez - the succession of the Nioulargue. The coast is, from now on, really not very nice anymore: buildings, villas, buildings - also high up the hills. Saint-Maxime, les Issambres and for of Saint-Aygulf (a little bit less spoilt). and the yellow and green line of the Argens' valley. The wind is freshening and turning east while we approach the coast; we make good progress, we want to get close to the very urbanised coastline. We easily identify the Basilique Notre-Dame at Saint-Raphaél. The entrance of Fréjus harbour in now very close; we gibe and just after entering the marina, we drop the sails The entrance is open to the east and wind from that direction gives a little swell. No room at the visitors pontoon , but we made again a phone call in the morning to ask for a berth, so we call on VHF 9 and have a rapid reply: number 223. 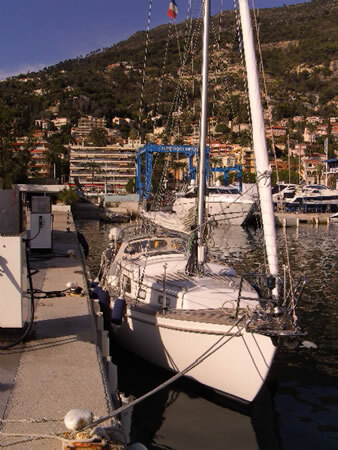 This big marina is surrounded by big modern buildings and there is nothing of an old centre: Fréjus ville - the town - is about 1/2 hour walk from the marina. There is good shopping and there are many restaurants in the vicinity of the marina... and open in October - in fact the whole year. 08.10.07 Today nice and warm weather. It's a half an hour walk to Fréjus town. The historic centre is very charming. 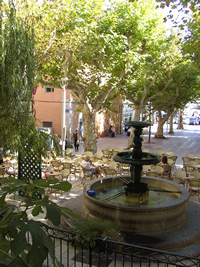 At place de la Liberté under a big tree next to a fountain a few terraces are very welcoming. We discover the Roman cathedral Saint-Léonce, the cloister, the narrow streets where we follow " the itinerary of the craftsmen " . 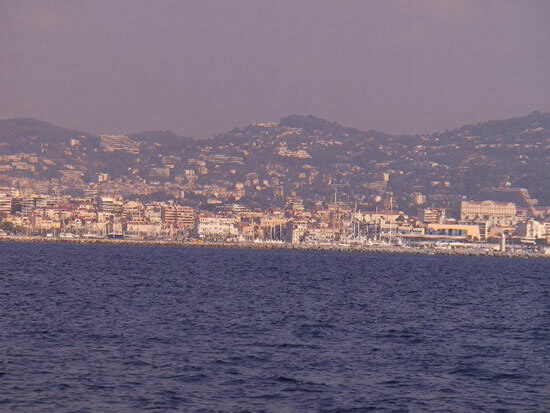 After our return to the marina, we decide to follow the seaside and arrive in about 20' in Saint-Raphaël. The harbour is very small and crowded - toilet & shower block is very poor - and a little but continuous swell - there is no wind - seems to make it rather uncomfortable. We visit la Basilique Notre-Dame and then stroll through the old town where we discover the Templiers church and la Tour carrée. 09.10.07 Port Fréjus is a nice marina, but we feel a little to much "surrounded" and "look at", we need air! So we leave about 11.30 heading for La Napoule-Mandelieu. In the late seventies and beginning eighties we already were there and have good memories ... big question: what will have changed? Today we will sail along one of the most beautiful stretches of the French Riviera: le Massif de l'Esterel , between Cap Dramont and La Napoule Bay. We have again nice weather and 1 to 3 variable wind that will establish S in the afternoon. To reach Cape Dramont, we have to pass by l'Ile d'Or ; there is a inshore passage with 6m depth according the pilot, but we prefer to go around. 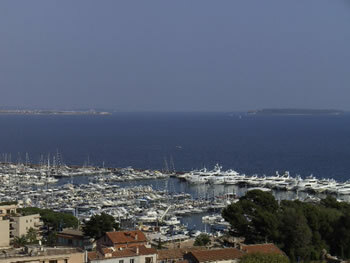 Some yachts are at anchor in the NW of the island just in front of l' Abri du Poussail. After Cape Dramont the wind is clearly south ; we sail by Figuerette and Port de la Galère and then behind La Galère Point are appearing Théoule and La Napoule, with its conspicuous castle. After a nice sailing - 19 knots wind - we eventually drop sails and moore at the welcome pontoon. Very complete formalities:boat papers, insurance, etc by a very friendly and accurate staff. We are directed to a berth on a quiet pontoon ... full of big motor yachts at one side ... but all unoccupied! 11.10.07 Time to explore La Napoule-Mandelieu: we discover the new Golf Club , the Sofitel with his private beach, the Cannes Marina on the Sianges river ( not for sailing boats: there is a 3,2 m bridge). This is all new, we don't find anymore the old villa where we stayed 20 years ago ... We climb up the San Peyre hill and overlook the whole area ... really a lot has changed but still it's worth a visit. 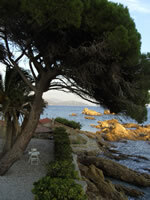 Then we follow the seaside (le Sentier du littoral) to La Rague, a small harbour - but no shopping in the vicinity. 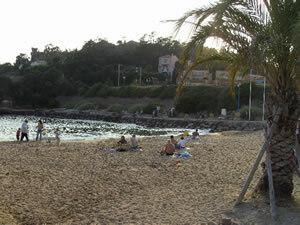 17.10.07 The mild weather, nice temperature (24°), the quietness of the marina, our daily swim at the little beach just halfway the Castle and La Rague, all this kept us a little longer in La Napoule. 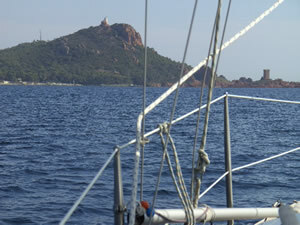 We also sailed to the Lérins Islands with a stop at anchor between the two islands.The gap between Sainte-Marguerite Island and Saint-Honorat is a popular and nice anchorage but the prevailing wind is east so its not possible to stay overnight: back to La Napoule in the evening, sailing in the wonderful red-orange light of the Baie de Cannes. 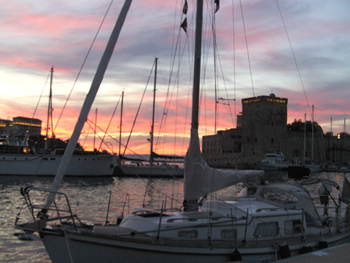 Tomorrow we want to go to Port-Vauban-Antibes. We already phoned and asked for a berth - a few days ago - but only now we get the green light: "c'était très difficile". 18.10.07 Departure for Antibes. A sunny day, but no wind, so we motor across the Cannes Bay. 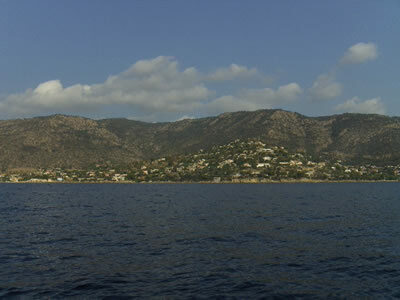 We pass between Sainte-Marguerite Island and Cap Croisette. This passage is only possible with calm weather because there is a brutal elevation of the sea bottom to a depth of about 4,5 m, so with strong winds, a nasty see builds up there. 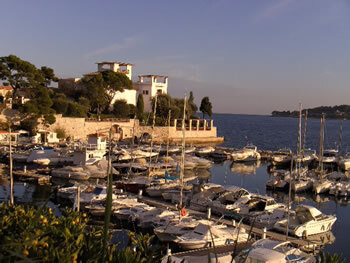 Between Cap Croisette and Cap d'Antibes, another bay opens: Golfe Juan. 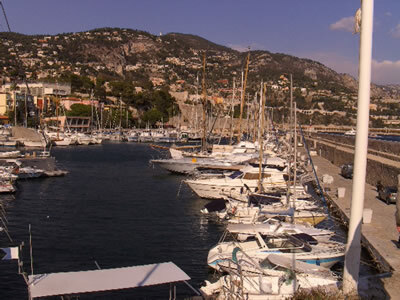 On our port we distinguish the marinas of Golfe Juan - Vieux Port and Port Camille Rayon - both behind the same breakwater. 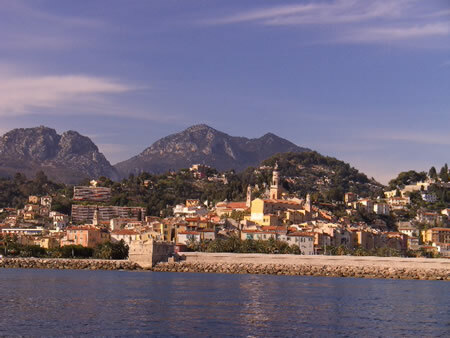 At the approach of Cap d'Antibes we pass by two other marinas, Port Gallice and the smaller Port du Crouton. 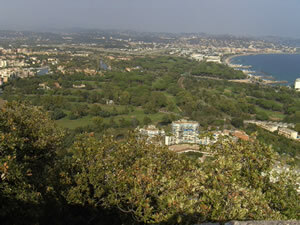 We go round Cap d'Antibes, a rocky, steep peninsula covered with pines and beautiful villas. Its lunchtime and we decide to anchor in l'Anse de la Garoupe in 6 m water. The water temperature is still very pleasant so we can't resist to have a swim. The wind finally arrives, we sail to Port Vauban, only a few miles further. 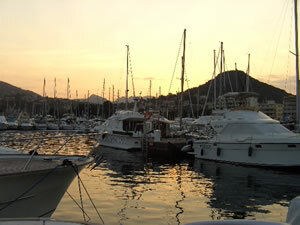 The harbour is very extended (25 ha) and mostly occupied by big and luxurious motor yachts. By VHF we get the number of our berth and some indications to find it; all the same, it's after a long search that we eventually find it. We have to push away the two neighbour boats to get in. It's a 25' walk to the Capitainerie because we have to go round the whole enormous basin. The marina staff is very friendly and helpful, so someone came to our berth to ask if everything was OK, but the facilities are very poor: in fact no toilets and showers open in the weekend (!?)! nearby our berth (the shower block on the Môle nord), so we have to do again the 25' walk (and 25' back) to the two really very dirty toilets and showers underneath the Capitainerie . We decide to leave tomorrow ... after a short visit to the nice town. 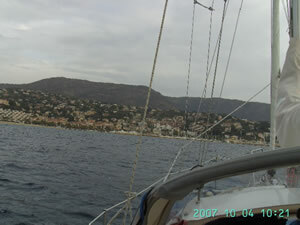 19.10.07 The weather forecast for this evening and tomorrow "grand frais à coup de vent": we leave for Villefranche, where - after a phone call - we get a berth for a few days. 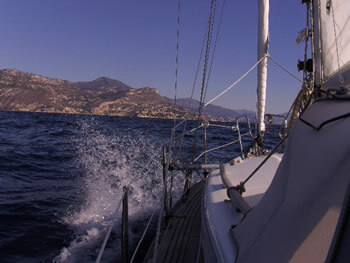 The 10 mile passage to Cap Ferrat is quick: we have 25 knots (app.) wind and with one reef in the main and a partly rolled genoa we sail close to the E wind to the entrance of the wonderful Rade de Villefranche. The bay is very well sheltered from the E, so after our wet passage, we find again calm water. After our VHF call, the very friendly harbour master is waiting for us in his dinghy and directs us to our berth. We feel immediately at home here: a small harbour - Port de la Darse -, a tiny town... It's only a 5' walk along the Castle (Citadelle-Hôtel de Ville) to join the old town with good shopping and many restaurants. The next day, two big cruising ships are moored in the bay, their passengers submerging Villefranche. We noticed that in fact an almost daily arrival of two or even sometimes three cruise ships is announced in october. There is a lot of wind with heavy gusts and even in this very protected bay the anchored sailing boats are rolling and dancing. In the harbour we have to keep an eye on our neighbours: mooring lines to the pontoon are very loose so the boats are moving a lot in the gusts. But all this didn't prevent us from visiting the upper town and "la Citadelle". 21.10.07 It is Sunday, and again very calm weather; not only passengers from cruising ships but also many visitors are strolling around the streets and the market. So we decide to walk along the bay in the direction of Cap Ferrat, until we have a view over both Villefranche bay and Beaulieu. On our return in the evening we find again a calm town and harbour. 21- 27.10.07 Monday morning departure for Beaulieu at only 4,5 miles just on the other side of Cap Ferrat. There we will wait until we can sail to Menton where we have a reservation for the winter, from 1 November to 31 March 2008. Beaulieu is "very British": big 19th century hotels and houses, splendid villas but we miss a little bit the charming streets of Villefranche: here is not a real old town. The marina is very well kept but looks a little bit like a boat parking. We have our berth in the very quiet north-east corner. We see only our very friendly neighbours and that's all ... So with normal weather we sleep very well. But autumn is there and and the first warning comes on Tuesday evening with a freshening easterly wind (a nasty low over Sardinia). The sea is breaking heavily against the very exposed harbour wall - just in our quiet corner - and huge masses of water are smashed over it. Luckily we are far enough from this violence but the first boats on the pontoon are literally submerged, by something like big waves! Also the lights on the road along the harbour wall are smashed out! Wednesday is a calm day but a new low is announced with "grand frais à coup de vent" for Thursday night ... with thunderstorm and a lot of rain. Thursday starts with sunshine, but the sky is covering during the afternoon with rain and in the evening it really starts raining heavily with freshening wind and gusts from the NE. Meteo-France corrects his forecast: "grand frais à fort coup de vent" for the night, completed with a bulletin concerning wave heights. We put extra protection on one side of the boat because we have on our starboard a very dangerous little concrete pontoon (no even half the length of the boat) where no rope can be fixed on! During the night we have to readjust this protection several times. Violent wind with terrible gusts - up to 44 knots on our rather "lazy" wind meter - is screaming over the marina. Our boat is not healing a lot but around us the spectacle is terrifying. Many boats are damaged: torn cockpit and genoa covers, broken ladders and fold stanchions... We don't shut an eye until 4 a.m. So it's important to avoid the NE corner of the harbour: it seems to be the most exposed. The next day we hear at the VHF that a catamaran with five persons on board, crossing from Corsica to Toulon, is missing! 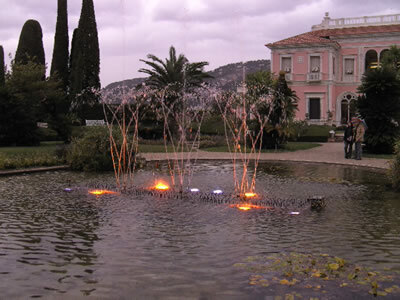 Visits of the Villa Kerylos and the Villa Béatrice Ephrussi de Rothschild, in our photo-album. 28.10.07 Sunday. Departure for our last trip: Menton-Garavan. Nice weather but less wind. Motoring we follow the coastline: Cap d'Ail, his harbour and busy heliport, then Monaco and its conspicuous Musée Océanographique on the Rock, higher the Palace, the buildings, the towers, this extreme urbanisation that has taken a lot on the sea - still more with the expansion of the harbour. In the Baie de Roquebrune some sailing boats are anchored, swimmers are diving from a big catamaran ... and then, already nearby Cap Martin. 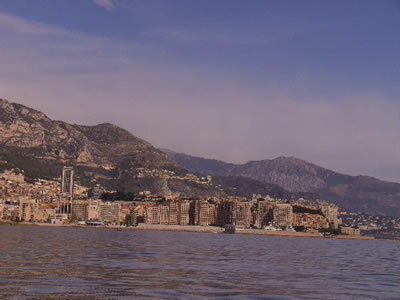 Menton appears behind this last cape : the Rade, the Old harbour, and in the NE, the Port de Garavan. Approaching we distinguish the Italian border at a few hundred meters from the entrance. Accueil. First we have to moor on a temporary berth, till we get on Monday our winter berth. So, that's the end of our 2007-voyage. We are hurrying to the Vieille ville, the covered Market, the rue Saint-Michel, the Place aux Herbes, the Place Clémenceau: our souvenirs are coming back: we remember, hesitate, affirm ... twenty-five years ... sixteen years ... but already we feel at home, just like it was ... yesterday!